Free PSN users have a brief window of opportunity for Assassin's Creed: Revelations multiplayer beta. In beta testing, as in a good assassination, timing is the key. PlayStation Plus and UPlay subscribers have been able to access the Assassin's Creed: Revelations multiplayer beta since early September, but regular PSN users have been left in the proverbial Dark Ages. Now, free users can sharpen their knives and join the fray. As of today, the multiplayer beta is available for all PSN users - but only until it closes on September 11, 2011. For those of you who just walked in, Assassin's Creed: Revelations will tell the final chapter in the sagas of Crusader-slayer AltaÃ¯r and Renaissance man Ezio, ancestors of series protagonist Desmond Miles. Like its predecessor, Revelations will feature competitive online multiplayer, but Ubisoft has made gameplay a little more robust this time around. The beta features characters with distinct weapon proficiencies, multiple maps, game types, special items, perks, and matchmaking capabilities. 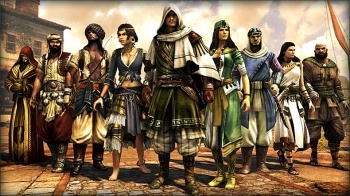 Many series fans were pleasantly surprised that Assassin's Creed: Brotherhood delivered both a solid single-player narrative and a novel multiplayer game. With Assassin's Creed: Revelations, lightning just might strike twice. If you have a PS3 and a decent internet connection, you can see for yourself, free of charge, for the next few days.